Of all Dickens' novels, A Christmas Carol must be one of the most well known and loved. Even those who don't know the origin of this story, will still surely be aware of a Christmas 'parable' involving a mean old miser who is visited by ghosts to make him change his ways and understand the spirit of Christmas. In this particular adaptation by Olivia Race, much of the original dialogue from the novel had been kept, and the storyline practically un-tampered. The whole felt authentic and yet quite compact too since the production lasted about 80 minutes through without interval. Front Room Productions have taken this promenade production on a mini tour and The International Anthony Burgess Foundation was their last, and only Manchester, stop. I am unaware of the other venues which they toured but tonight's venue was less than ideal for a promenade show. The vast majority of the presentation took place all within the same space, so, despite small items of set being located at differing areas within that space we never really got an idea of travel, needing only to turn our bodies to go from Scrooge's office to his bedroom to Fred's parlour etc. The idea that we, the audience, become a part of the story and are used frequently throughout as party guests or even as a stand-in young Scrooge was a good one though, and worked surprisingly well. The 'feel' of the play concerned me slightly. It really wasn't sure what genre it wanted to be in, and kept switching from high drama to It's A Knockout style comedy within the blink of an eye. 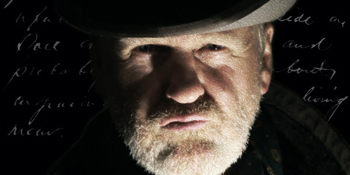 The very real and excellently measured portrayal of Ebenezer Scrooge by Mick Liversidge was in total contrast to the comedic bounciness of children's entertainer styled Fred, by James Barrett. The morose and mysterious Ghost Of Christmases Yet To Come (Olivia Race) was in total apposition to the neurotic dipso interpretation of The Ghost of Christmas Present (Katie Tranter). I understand that we were meant to be happy and jolly when being asked to partake of party games and dances, but I did find it odd that we were also laughing at things which perhaps we ought not to have been; unless of course the whole play was a comedy; which it certainly is not. The other thing I would mention here too is language and accent. If we really were to be transported into Victorian England then the language used at that time differed greatly from our own and so when it came to the improvised scenes, it put an unfair onus on the actor to try and keep up with Victorian speech, and so the actors tended to revert back to their normal speech patterns. This also meant that there were an infinite number of accents on display this evening too. Many from the same actor playing the same character! We went from broad Cockney to broad Yorkshire in the same sentence. This is also something which needed to be looked at in more detail and a definite location for the play to be set. Whilst I am talking about the improvisatory element of the show, then as all actors know, the first rule of improvisation is acceptance and not to block. Why then, when a correct answer to one of the guessing games was suggested by a member of the audience did they ignore it and continue with the scripted part of the game. That particular audience member (me) felt snubbed and no longer complicit in the production. All the cast were singers or musicians or both, and before the start of the show and throughout in order to change scenes or heighten mood, music and singing was used to very good effect and I liked the choices of song. It was however too loud to be played when there was dialogue to be spoken, especially when actors were straining their voices over the brass instruments. The costumes were token costumes only and not at all authentic, and the lighting very poor. However, I do know that the constraints of the venue would not permit better lighting sadly. The sound of Marley's chain though was very effective. As I have already written, Mick Liversidge's portrayal of our protagonist was delightful, and I thoroughly enjoyed watching him this evening. Coming in at a close second was the very personable and easy to watch Leslie Davidoff who played Bob Cratchit with aplomb. The Ghost of Jacob Marley and the rather effete audience-working character of Fred were played by James Barrett, with Claire-Marie Seddon, Katie Tranter and Olivia Race as the three Christmas ghosts. Kim Burnett was a loud and friendly Mrs Cratchit, and in this evening's production the small role of Tiny Tim was played by Isabella-Rae Royle. It was, in conclusion, a show of mixed messages and unfocused, but the earnestness with which the actors played their roles, and the quality of the acting made up for this and it did prove to be an entertaining, even if it wasn't wholly satisfying, version of this classic tale.